"Life is all about gathering memories and a few days here will certainly give anyone memories to treasure forever"
"Great scenery, culture, awesome climbs, mega descents and good company...."
"Cannot recommend it enough. Been four times, back for more in 2016." 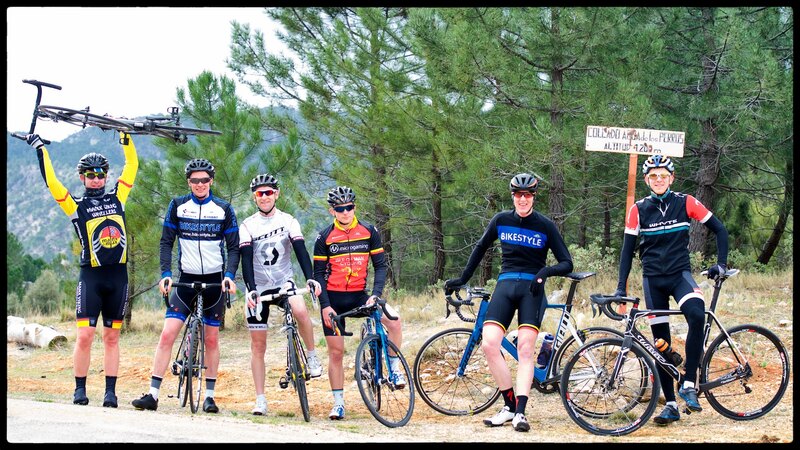 ""Fabulous fire-trails, forest tracks and stunning scenery"
"Anyone wanting traffic free riding (a car every 10-60 mins), great scenery, culture, awesome climbs, mega descents and good company....get yourself out to Cool Sierras. Great routes, great stop overs and basically the best riding I have ever done. Not your typical head down, ascienda up, but mega riding, great training on hills, skills on descents and plenty of craic in between. Cannot recommend it enough. Been four times, back for more in 2016." "What a an awesome weekend….fantastic. The scenery was tremendous….the heart skipped a beat when we were riding down a slightly chalky road alongside a field full of trainee bulls….with sharp horns…..they took the direct route, we had a dog leg to navigate…thankfully the skilled men on Spanish horseback spared us the challenge of outrunning a bull on an S-Works SL2….not sure Cav and Brad Wiggins ever resort to training like this….one for the memory bank for sure. The rest of the trip was less eventful, but awesome anyway. Howard and Lucas were excellent hosts and the Landrover came in handy as always…a welcome sight after a lovely long day in the saddle." "Flew away from the miserable winter UK weather and was treated to the fabulous blue skies and terrain of Spain. Howard was a wizard of knowledge and took us onto some great rides that wouldn’t put us off for the following day. Enthusiastic and encouraging (for a Yorkshireman), what could have been a week of hell, turned out to be rewarding and fulfilling – definitely want to return and tackle some of the more spectacular areas, once fitter ! You wont leave without the inspiration and determination to get back out there!" "The accommodation, food and local tapas, beer, wine (note the not so fine-tuned diet) were all 5*. We’re going back and already have sold this to quite a few crew who want to come along. You won’t regret it. Thanks to Howard and his family for a great week – couldn’t have been better … it beat all my pre-trip hesitation, nerves etc – FABULOUS !!!" "Having not been on a bike since the Isle of Man End2End, a pretty unfit pair decided to take a week’s break to visit Cool Sierra’s. A fabulous hotel set in an equally impressive location. Over the week, we rode 4-6 hours a day. Nothing over-stretched our limited abilities. Fabulous fire-trails, forest tracks and stunning scenery, all rides were carefully thought out and Lucas gave great support in the LandRover. Some great local cafes and bars – check out the local beer and wine. Howard and his family were good fun and great hosts." "If you want informative mountain biking or road riding in breath taking countryside then this is it. I’ve been mountain biking with Cool Sierras 4 times now and in 2016 will be going with 5 mates again. Life is all about gathering memories and a few days here will certainly give anyone memories to treasure forever. I’ve been involved in cycling for nearly 40 years through road racing and managing successful teams, coming here is a most welcome change, I’ve been able to spend great days in the saddle with great friends, enjoying the craic and warming your bones whilst watching wildlife that only remote Spain can offer. I would 100% recommend a few days with Howard at Cool Sierras to broaden your horizons. Thanks for a great time!!" email addresses available on request.